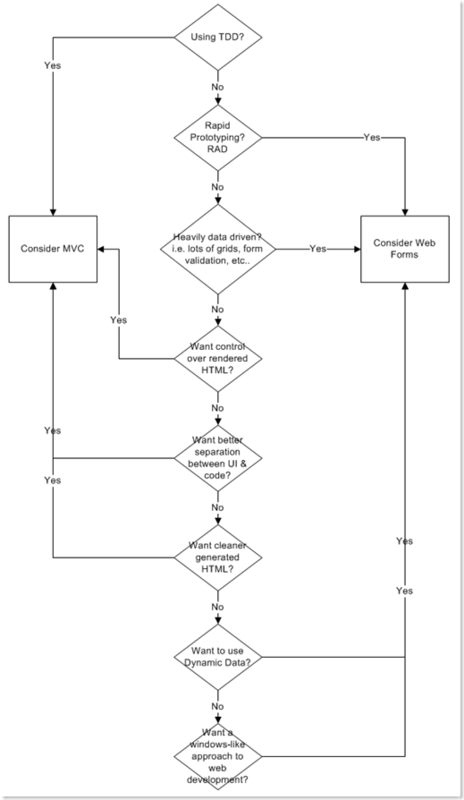 I am trying to create a decision flowchart for my ASP.NET MVC book and wanted to get some community feedback. Does this diagram make sense? What other factors should one consider that should make it into the chart? I have tried to use the general consensus of the community for each decision. For example, some might argue that MVC is better for prototyping but I would say the majority would disagree. The "No" branch doesn’t mean exactly NO. I mean, answering No to "Want cleaner HTML?" doesn’t mean you have something against clean HTML or you want crappy HTML – no one wants that. Think of the question in terms of "is clean html important to you?" Let me hear your feedback below and I will incorporate it in version of 2 of the diagram and post it back on the blog. Hopefully, this will help someone choose between ASP.NET MVC and WebForms on a new project. 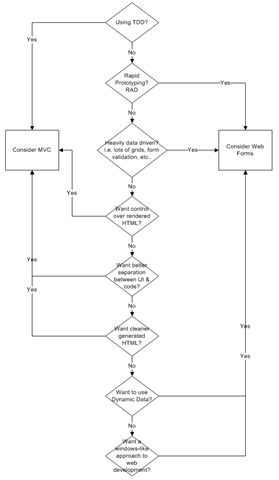 Also, I don’t think a flowchart diagram is the best type of diagram for this type of decision tree. Can you suggest a better format?